The military history of ancient India has not attracted the attention of scholars in sufficient measure. Naturally not many good books are available on the subject. Consequently Indians know little about the military system followed by their ancestors. A serious effort is therefore needed to analyse and interpret the source material which lies scattered in ancient Indian literature, including scriptures and archaeological remains including inscriptions and coins to produce a tangible and coins to produce a tangible thesis on the subject. This book is an humble effort in that direction. The book tries to present a complete picture of Indian military system from the earliest times. The topics covered included military organization conduct of war strategical and tactical concepts weapon and armour fortification education and training and ceremonials. Some ancillary aspect related to war such as defence production, logistics, intelligence, medicals services, engineering, signals, etc., have also been covered. The study is based on historical data. The myths and legends if not supported by historical evidence has been ignored. Each chapter is a complete study and is intended to generate a new thinking on the subject among lay readers and scholars alike. Born in Uttarakhand in 1938, U.P. Thapilyal retired as the director of the history division ministry of defence government of India. He is the co-author of historical perspective of warfare in India: Some moral and papers have been published in leading historical journals of India. His volume Swatantrata Andolan Ka Itihas was selected for a state award by the Delhi Government in 1984. In 1994, I happened to be in Jadavpur University Calcutta in connection with a meeting of the Indian historical records commission. After the inaugural session when the members gathered for lunch, a tall young boy perhaps a M. Phil student approached me and said that he had studied my book foreign elements in ancient Indian society and that he found it to be most useful. During further conversation he requested me to write a book on military history of Ancient Indian as there was need for it in the university. After this chance meeting I Completely lost the track of this young man and even forgot his name. But his request I could not forget. It is a matter of great satisfaction to me that I have lived to comply with the request made by a student in 1994. I wish my effort measures up to his request made by a student in 1994. I wish my effort measure up to his expectations. This book which took me about ten years to complete is dedicated as a token of gratitude to Jadavpur University. In writing this book I have mainly depended on the information culled from the Vedas Brahmanas epics, Dharmasastras puranas and Niti works, archaeological reports and inscriptional and numins-matic source. I am particularly indebted to the pioneering works of A.C. Das (Rgvedic Culture), E. W. Hopkins (The Social and Military Position of the Ruling caste in ancient India), V.R.R. 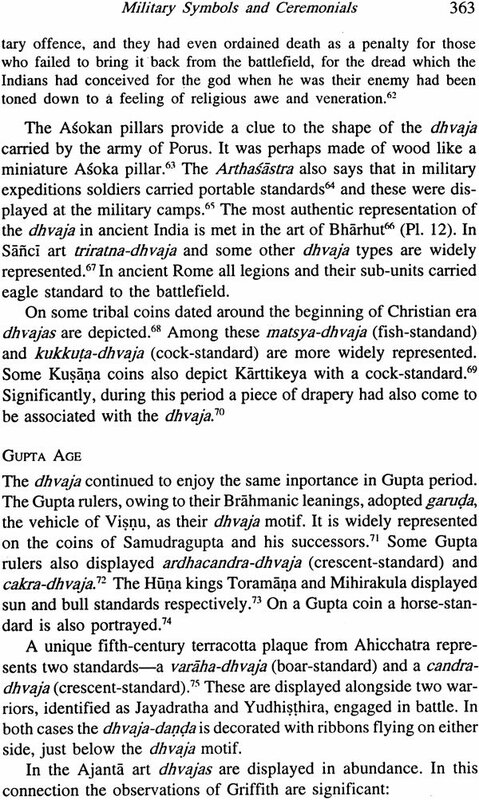 Dikshitar (War in ancient India) P.C. 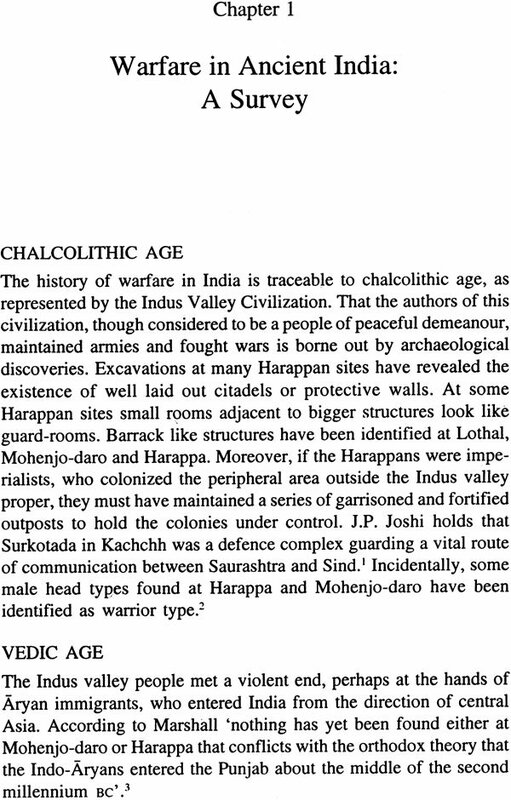 Chakravorty (Art of War in Ancient India), G.N. 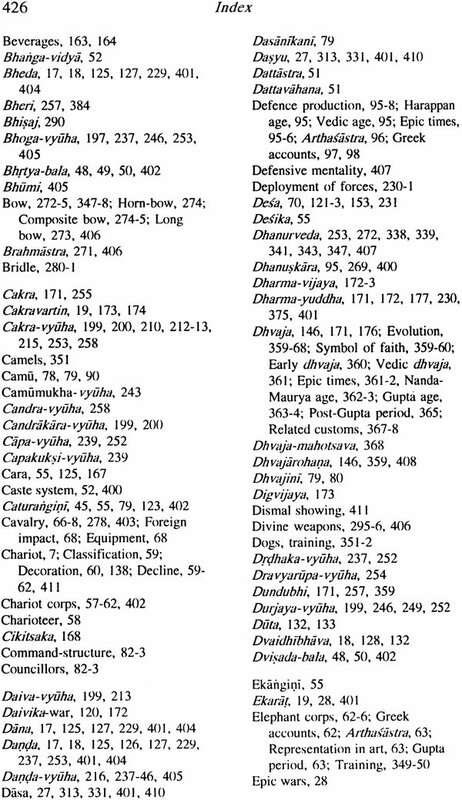 Pant (Studies in Indian weapons and warfare), S.D. 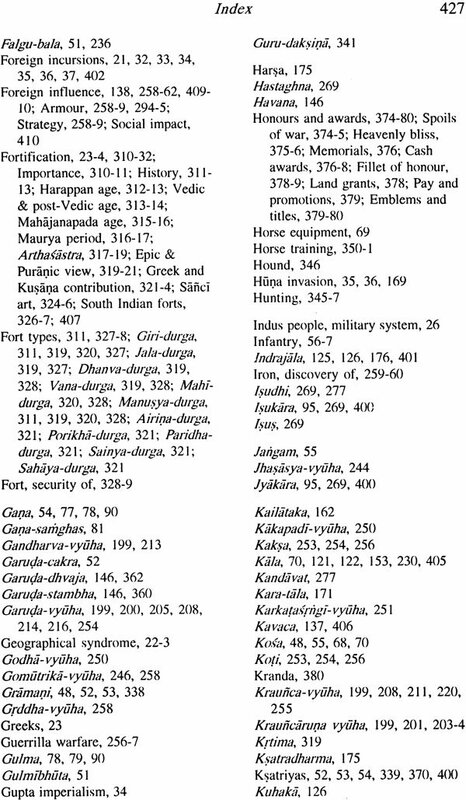 Singh (Ancient Indian warfare with special reference to the Vedic period), and many others whose works have been mentioned in the bibliography. In the context of this study it is notable that India suffered many foreign invasions during the long course of her history. These invasion besides influencing the social and cultural life of the people may have profoundly influenced the military system and the art of warfare. This aspect has been touched upon in this volume to some extent but for a subtle assessment of foreign influence a more comprehensive effort would be required. I wish somebody makes it a subject of research study. The subject has been divided into nine chapters with a view o examine it comprehensively. The introduction deals with the basic of warfare relevant in Indian context. The first chapter portrays the general scenario of wars in Indian context. 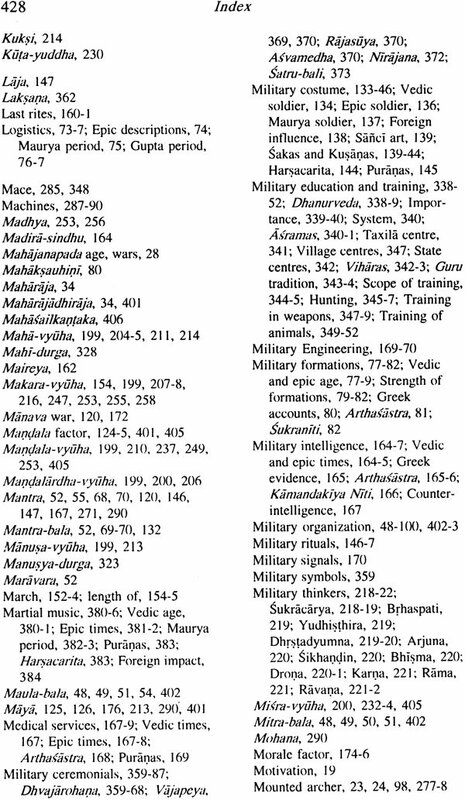 The first chapter portrays the general scenarios of wars in Indian from proto-historic times and is fundamental to the contents of the following chapters which include Military Organization conduct of War, Strategical and Tactical concepts weapons and Armour Fortification and siege craft Education Training and military symbol and ceremonials. A word may be added here on the chronological aspect of the source material as there are serious difference among scholars on dating archaeological and literary data. To illustrate the point the Harappan civilization is dated anywhere between 3000 and 1500. The Mahabharata is said to have been complied anywhere between 3000 and 400. The Arthasastra was supposedly compiled between fourth century and third century. Inter potations are rampant in all works. However this monograph is based on the assumption the Rgveda was finally compiled around tenth century Buddhist Nikayas and vinaya texts in fourth century and the Arthasastra around second century. Each of these compilation however contains data pertaining to earlier periods as well. 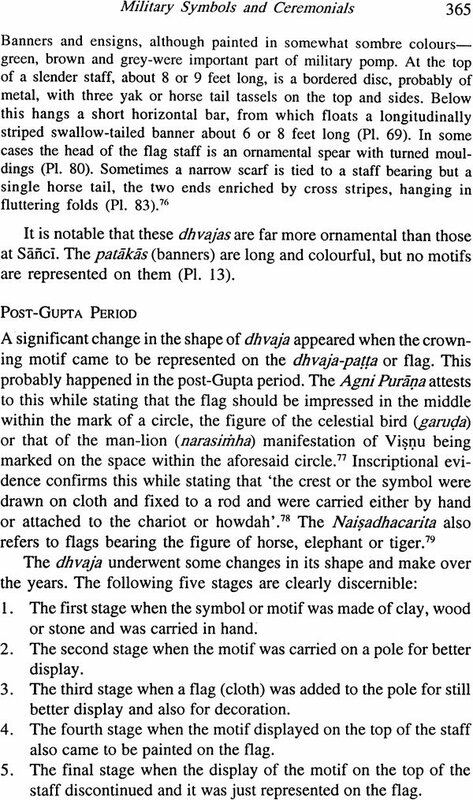 To illustrate the point the references to the predominance of chariot in battlefield and the coronation of senapati before assuming the command of troops suggest definite Vedic association. In most of these works fantasies and myths are inextricably mixed with historical facts making it really difficult to separate the two. In this study the material it really difficult to separate the two. 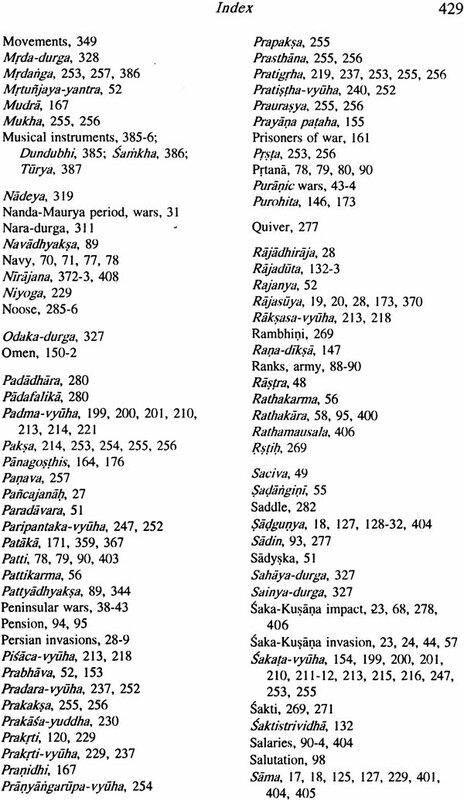 In this study the material culled from the Vedas, epics, Puranas, Dharmasastras and Niti works has been assessed and utilized in historical perspective. Myths and legends unsupported by historical evidence have been summarily ignored. I would like to express by gratitude to my teachers Dr. Romila Thapar of Jawaharlal Nehru University Dr. Devahuti of university of Delhi Prof. J.S. Negi of Allahabad university and Dr. S.N. Prasad of the Ministry of Defence who taught me the lessons of history, I also bow my head sacred memory of my parents, Pt. Suresth Nand Thapliyal and Smt. Sarasvati Devi persons of great wisdom who always reminded me of the value of education. I also express my thanks to my friend sarvashri Dr. G.P. Bhatt, G.B. Singh R.S. Bisht D.D. Nautiyal H.N. Nautiyal Bijali Singh Rawat Smt. Reva Dhanedhar Smt. Karuna Srivastava and Shri Umesh Chand Nailwal for the help rendered in various measures. My brother shri. S.P. Suman wife sarojini and brother in law shri J.P. Ghildiyal have always been a source of inspiration to me. I have no words to express my gratitude to my brothers late Shri Dwarika Prasad Thapliyal and Bhagwati Prasad Thapliyal who gave me the vision to see the world of letters. Finally I record my thanks to Shri Ramesh Jain of Manohar publishers &amp; Distributors for his efforts to publish this volume. Indian political thinkers considered war as an extension of Polities a fallout of interstate relations. They held that Uapyacatustaya (four means) viz sama (conciliation) dana (gift) danda (Punishment) and bheda (discord) should be applied to serve the interest of state. Of these danda which means resort to war to be applied to only when the other three have failed to achieve the desired objective for war was a risky proposition. The Manusmrti ways that a ruler should try to achieve his political objects by influencing or alluring the rival king his ministers and commander in chief. Alternatively he should sow seeds of discord among his ministers and officials and then taking advantage of the situation pressurize him to accept his demand. Evidently manu was in favour of avoiding war as far as possible. This concept of war is reiterated in the Mahabharata also. While deliberating upon the future course of action by the Pandavas Krsna pleaded for reconciliation. When he went to Kaurva court as an emissary of Pandavas he strongly against war. It was only after Duryodhana refused to return even five villages to Pandavas that Krsna consented to the application of danda. 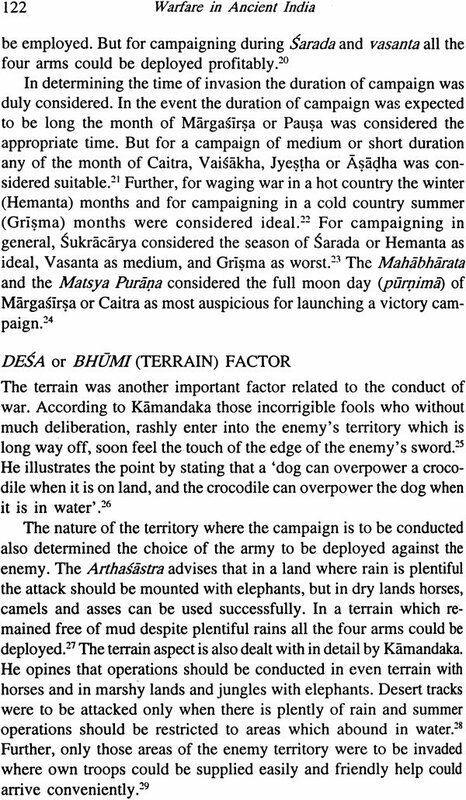 The epic therefore considered the vitory earned by discord (bheda) as the next best and the victory earned by war (yuddha) to be the last in terms of preference. 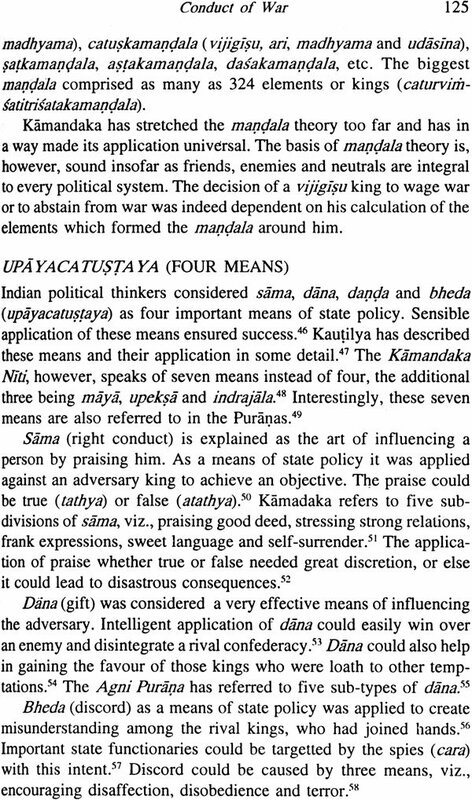 At another place the epic says that a king who has the welfare of the state in his heart should avoid war and should remain satisfied by the gains made by the measure of Sama danaadn bheda Kautilya also refers to these four means of state policy and their application in inter-state relations and personal relations. The Yajnavalkya Smrti says that the option of war should be exercised only after all other options have been exhausted. The sukranti elaborates that each of the four means should be exercised only after all other option have been exhausted. The Sukranti elaborates that each of the four means should be applied by the ruler in such a manner that friends neutrals and foes alike remain in his grip. It says that 0first the policy of sama should be applied by the event if fails the principle of dana should be applied. In the event if fails, the principle of dana should be applied. If it also fails as a third option bheda should be resorted to. The policy of danda or war should be applied only when the existence of the state is threatened. 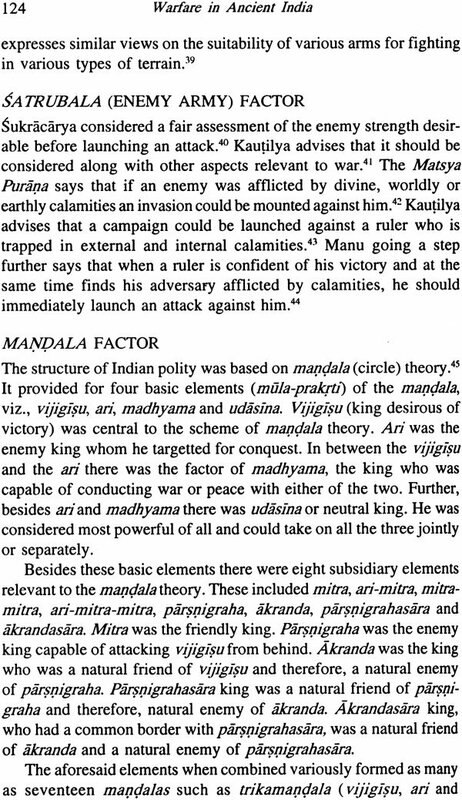 Related to these four means of state policy there were the six measure (sadagunya).. sandhi (treaty), vigraha (conflict) asana (staying quiet) yana (marching), samsraya (seeking shelter) and dvaidhbhava (dual Policy). Kautilya advises that when a ruler is weak he thinks that neither he nor the enemy is capable of harming each other he should stay quiet. When possessed of invincible might he should march against the enemy but when weak in strength he should seek shelter with more powerful ruler. If the objective could be achieved with the help of an associate king, a dual policy of war and peace should be followed. A resort to war was to be made only when a ruler was prospering and military strong. The Manusmrti advises that these six measures should be applied after deep thought and heard deliberations. It elaborates that the ultimate these measure could be applied in two ways though the ultimate objective remained the same. Puranas also hold similar views. Thus in ancient India the option of danda (war) or vigraha (conflict) as a means of state policy was chosen after great care and that also when all other measures have failed in realizing the political objective. Despite this much espoused aversion to war the history of India is crowded with wars as detailed in Chapter. Behind this unending story of wars in India two factors stand out as important. Firstly it was the large size of the country which encouraged the growth of tiny kingdoms and their unending conflicts. In this context it is notable that whenever a mighty ruler imposed his hegemony over the country the frequency of wars slowed down. To illustrate the point after Candraupta Maurya had succeeded in unifying the country politically not many wars were fought during the rule of his successors Bindusara and Asoka. Similarly after Samudragupta his successors Candraputa and Kumaragupta hardly faced any challenge to their authority. 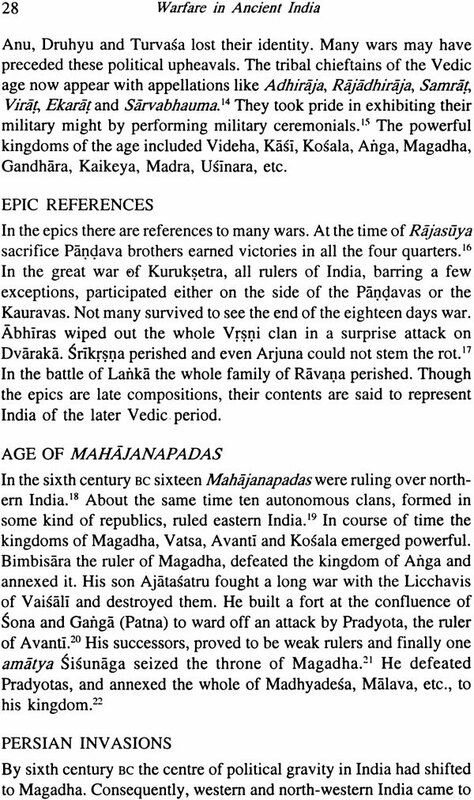 On the other hand the decline of Maurya, Kusana and Gupta empires was followed by political upheavals and wars. From the earliest times the Indian rulers harboured the ambition of wielding unfettered authority. A hymn in the Atharvaveda demonstrates this. Increase, O India this Ksatriya for me; make thou this man sole chief of the clan: unman all his enemies make them subject to him in the contests for pre-eminence. This concept later manifested in ruler assuming titles like samrat ekarat sarvabhauma cakravartin etc. some even aspired to achieve indratava (the status of Indra). Ambitious king went about performing sacrifices like asvamedha rajastiya etc to demonstrate their superior status in the community of rulers. In the epics rama and ydhistra are described as having performed these sacrifices. Ancient Indian history is replete with references to kings who performed asvamedha sacrifice. Since conquest of all kingdoms was a necessary precondition for undertaking these sacrifices many wars might have been fought on this account only. In face war in itself was considered a yajna or sacred ritual in the Brahmanic pantheon. 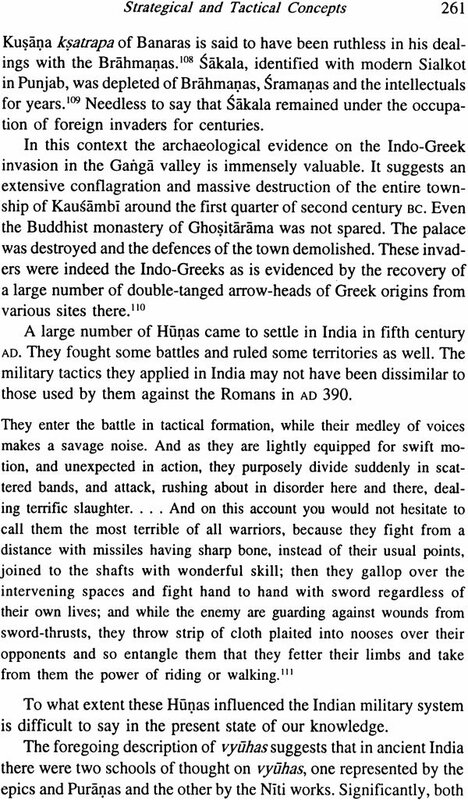 The warfare in ancient India generally remained immune from savagery. The battles were fought between the contending armies and civilian population was left undisturbed to go about its vocations. This is amply borne out by the references in the epic. Megasthenese the Greek ambassador in the court of Candragupta maurya attests to this. Whereas among other nations it is usual in the contests of war to ravage the soil and thus reduce it to an uncultivated waste among the Indian on the contrary by who husbandmen are regarded as a class Indians sacred and inviolable the tillers of the soil even when battle is raging sacred and inviolable the tillers of the soil even when battle is raging in their neighbourhood are undisturbed by any sense of danger. War is prior to state in the sense that it precedes the evolution of the state. The overriding necessity of a leader among the ancient tribal hordes who were perpetually at war may have led to the elevation of the most powerful member of the tribe as commander or king. 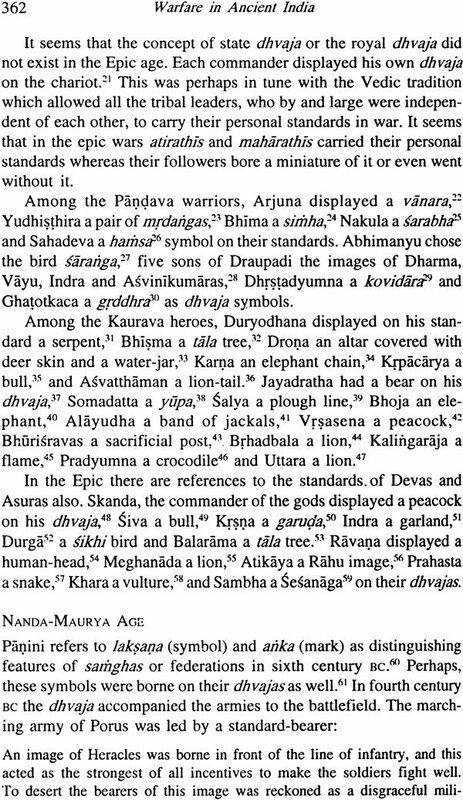 Indra the Vedic god of war has been addressed as a commander and not as a king in the Rgveda. In the Aaitareya Brahmana a story goes that at one time a war erupted between Devas and Asuras in which the former suffered a crushing defeat. Pondering over the cause of their defeat the Devas concluded that asura owed their victory to their leader. They also elected a leader who led them to victory in war. This story may be referign to some real historical content pciked up from an earlier period. The aryan hordes during their military adventures may have suffered reverses at the hadns of their opponents who were perhaps better led by a capable commander. 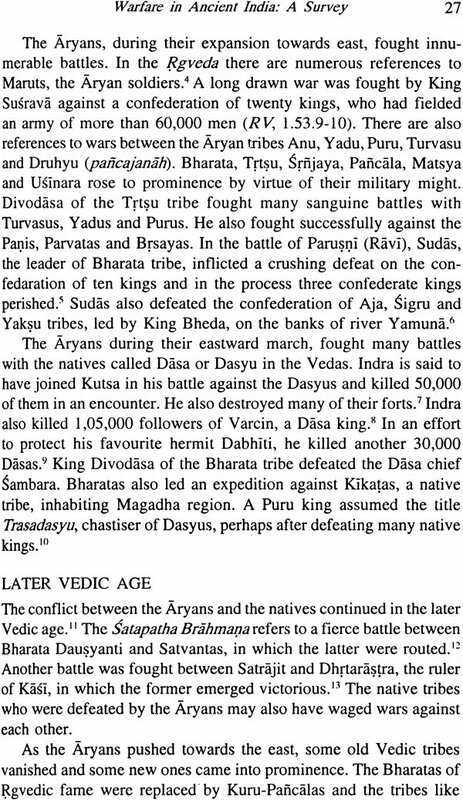 Following them the Aryans also elected the bravest among them as leaderand defeated the Asuras. In ancient India the evolution of large armies was intimately related to the emergence of kingdoms. Earlier to this the tribal states organized small armies or say militia for the defence of the defence of their teeritory. But in the new political setup the kings needed large armies both for defensive and offensive needs as they wre generally in a state of war. Conquests earned them the status of a samrat virat etc. The ambitious rulers went about performing asvanedha rajasuya and vajapeya sacrifices to bring as much territory as possible under their sphere of influence. No doubt any such effort requiredthe beackup of a powerful army. Thus the institution of monarchy encouraged the growth of large armies in ancient india. Foreign invasions also contributed to the war galore, substantially what attracted the foreign invaders to India was the fertility of the land and the prosperty of the people. In respect of the Aryans it could be said with greater certainty. That the Aryans believed in seeking wealth through war is abundantly clear from Vedic literature. A rgvedci hymn addresed to asvins syas: O mighty ones ye gave Sudasa abundant food brought on your treasure laden car so now vouchsafe to us the wealth which amny creave either from heaven or from the sea. Antoher hymn prays to Indra: hither O Indra brings us wealth in steeds and cattle hundredfold; bring wealth O soma thousandfold. The story of cattle lifting by Kauravas as narated in the epic may as well be a reminder of the pristine society where kine was the chief motivating factor behind war. The persian monarch Darius may have turned towards India for economic reason as be might have learnt about the affluence of sindh and punjab. This is proved by the fact that these indian Ksatrapies (provinces) contributed the highest tributes to the imperial treasury. The march of the Bactrian Greeks may have been inspired to an extent by the need to open a trade route from Taxilla to Gangetic extent by sakas and kusanas once settled in the north west conplains. The sakas and east to share the wealth of the country generated by flourishing trade with rome. The long drawn war between the sakas and satavahamans may have been inspired by conflicting trade interests particularly on the western coast. Indian trade with the countries of south east asia may have been backed up by military might. Samudraguptra exercised political authority over some island kingdom. It is belived and perhaps rightly so that the Cola invasion of south east asian kingdam was an extension of plunder dynamic of military conquest and that the Cola warfare should be viewed as and economic acitivity. 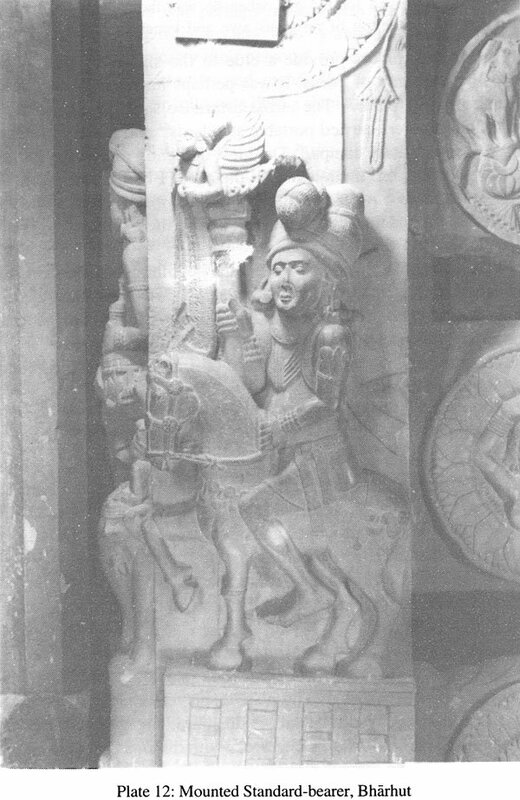 The Arab conquest of sindhu was also prompted by the trade interests. In ancient period the country witnessed major political developments in the eastern region. Consequently the great Indian empires had their capital located in the east at pataliputra. Generally the north-western part of the country which was away from the seat of imperial powers was ruled by some petty subordinates or independent rulers and therefore suffered neglect. If the centre of political power had been located at Peshawar of Lahore, perhaps the invades may not have had a free run into India. Related to this phenomenon of foreign invasions is the geographical setting of what may be called strategical topography of the Indian subcontinent. Himalayas in the north sea in the south desert in the west and the dense forests and foresters and inhospitable lands in the east made any ingress from these directions difficult. The only direction which was left open to invaders lay in the north west the khyaber and bolan passes allowing passage through the Kabul valley or the sulaiman range. There was also a route through the northern mountains the one that follows the karakoram highway through gilgit chitral and the Hunza valley. This route might have been used more frequently during the time of Kaniska who ruled over Kashmir as well as the adjoining central asian territories of Kashgar Khotam and Yarkand. Though the route might have been used by travelers armies marched into India thought he Karakoram highway. The sea route were known to Indians from proto historic times but these were often used for carrying peaceful trade with the countries of southern east asia and the roman empire. Surprisingly no invasion was launched against India through eh sea route in ancient times. However some south Indian through the sea route in ancient times. However some south Indian kingdoms did carry arms across the seas perhaps to secure their trading interests. The geography again determined the mode of Indian warfare. The geographical setting of India was such that most of the battles were fought in the plains of Punjab and Uttar Pradesh which fell on the route of the invaders. 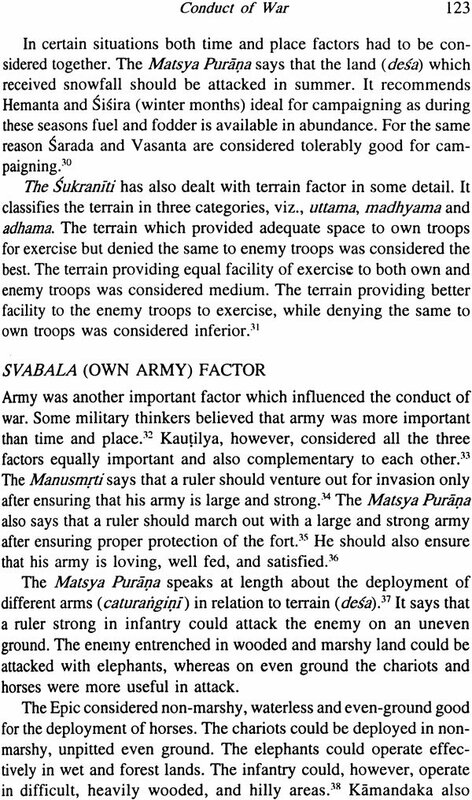 This was perhaps the reason why Indian military tinkers like kautilya kamadakaor sukracary do not speak of battlers in jungles and hills. 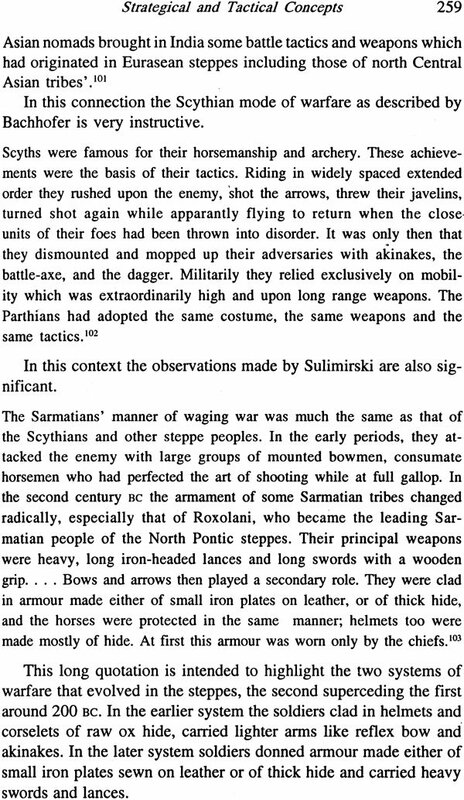 The system of Vyuhas (battle arrays) propounded in the epic also suggests this. The terrain also determined the use of various arms in the battlefield. The chariot was used in Indian warfare from the Vedic times because the battles were generally fought in level terrain. This also explains the wide use of elephants. The cavalry and foot soldiers did not command a high respect among the arms in ancient India because of their limited utility in a war which was dominated by chariots and elephants. 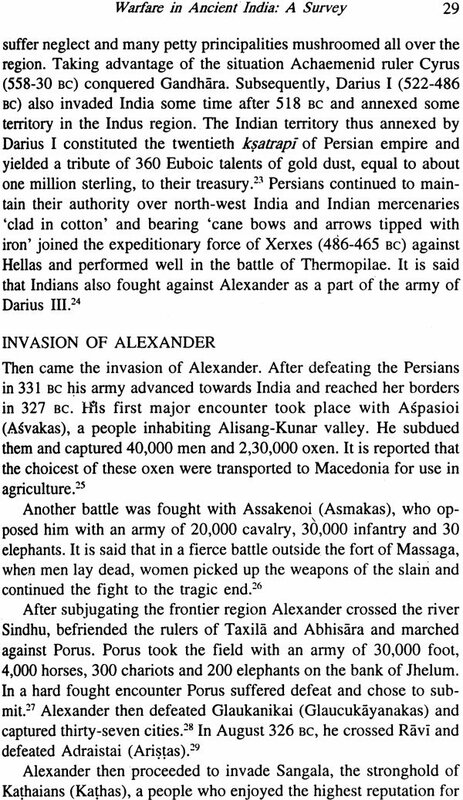 Alexander invasion subsequent saka-kusana invasions changed the Indian perception about the utility of chariot in war and gradually it faded out of the Indian battlefield. But the elephant continued to maintain its supremacy through the centuries despite in the battlefield. But the elephant continued to maintain its supremacy through the centuries despite many obstacles. The disadvantage in the use of chariots and elephant in the battle was that they did not allow the full use of the tactics of surprise mobility and deception in warfare. 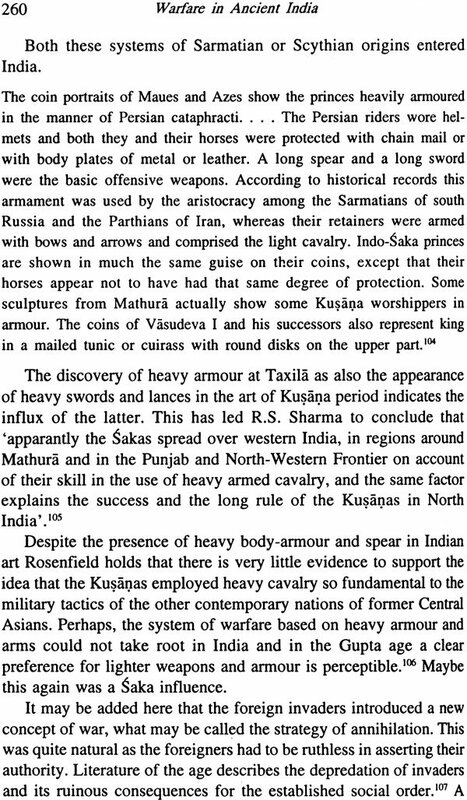 The saka-Kusana invaders with mounted archer as their principle arm introduced these elements but the traditional Indian system generally remained unimpressed. Indian had developed a good fortification system as early as the chalcolithic times is evident from the excavations of the Indus sites such as Mohenjo-daro Harrappa, Kalibangan, Lothal and Dholavira. During their territorial expansion in India Aryans encountered a number of forts built by the Asuras who were perhaps the original inhabitants of India. The epics the Arthasastra and the accounts left behind by the Greek historians give details of the Indian forts around their habitations. But the most significant fact is that despite abundance of forts Indians never succeeded in checking the advance of the invaders. Obviously these forts failed to stand before the assault of the invading armies. In fact these forts were generally built to give protection to the cities and were not built at strategic points of military importance. In ancient Indian literature there is not a single reference where an invading army was repulsed by the forces stationed at a fort. An elaborate system of mobile and immobile weapons mentioned in the epics and the Arthasastra which was meant to provide protection to the fort simply did not work. 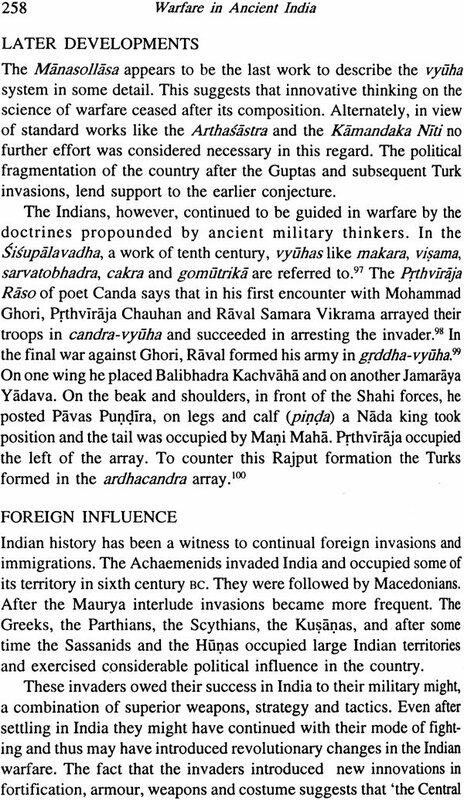 Indians had developed a sound military system but they never updated in the light of experience gained in the battlefield and so not seem to have learnt much from their unsuccessful encounters with Achaemenids Macedonians and the Saka-Kusans. They clung to their traditional mode of warfare unmindful of the ground realties. Thought chariot had been discredited in the battle of Jhelum and elsewhere it took Indians centuries to discard it as an instrument of war. On the other hand despite the established superiority of mounted archer of the Saka-Kusand army Indians did not adopt this novelty in their system of warfare. Ironically soon after settling in India the invaders also became enamoured of Indians elephant and discarded the advantage of mobility in war, associated with the use of horse. This was surprisingly true in the case of mihirakula the huna invader. He is said to have maintained a large force of 2000 elephant. Each elephant carried ten men armed with sword and spear on its back. To fight at close quarters swords were also tied to the trunks of elephants. In conclusion, it appears that the system of warfare in ancient India though conceptually sound proved a failure when it came to application as it could not adjust to the changing times and situations.